This baby quilt is a fun, unique quilt that will stretch the confident beginner and delight the more experienced quilter. Each block has four identical paper-pieced sections that are sewn with a 3” nine-patch in the center. The block is then put together with partial seams. The nine-patch in the center of each block anchors the dizzying, mesmerizing optical illusion once all six blocks are joined together. Skill level: Confident beginner through experienced quilter. Methods learned: Simple straight-line paper piecing, partial seam piecing, managing bulk at intersections, and sharp points and how to quilt them. What students walk away with: All students should finish at least one block in class and leave with the confidence to finish the project at home. What makes this class fun: Creating a unique block that looks harder than it actually is—the WOW factor is undeniable! Each student needs enough room to press and cut next to their machines. Have rotary mats and ironing boards set up for those who don’t have personal-sized equipment. Also, have plenty of trashcans (or encourage students to bring a brown sack for trash). See p. 41 for Starburst pattern and instructions. From each color, cut 7 strips 1 1/2˝ x WOF. Two each will be used to make the nine-patch centers; reserve the rest for the pieced border. From Color 1, cut 5 strips 2 1/2˝ x WOF for binding. From each color, cut 8-9 strips 3˝ x WOF for paper-piecing. 2. Demonstrate how to paper piece the block units. 3. Once 4 paper-pieced units are done, demonstrate how to use partial seams to piece the block together with the nine-patch block in the center. 5. 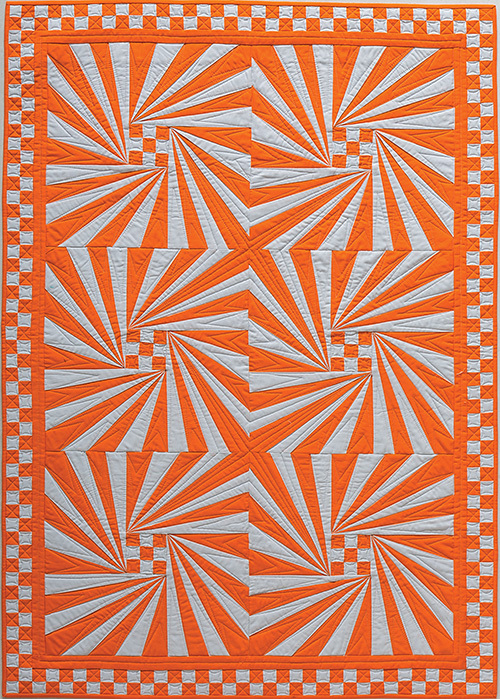 Discuss quilting and how to manage the bulk at the corners of the nine-patches.